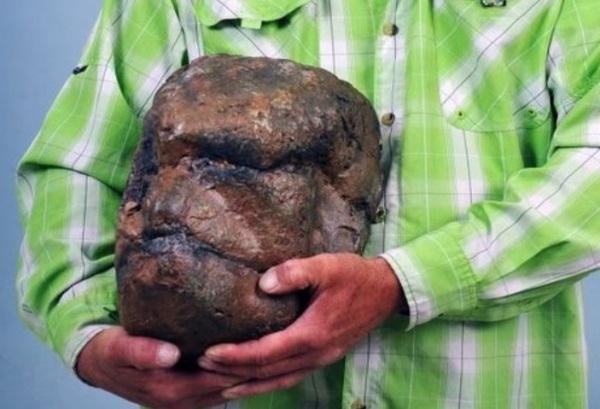 Shocking discovery: Has this man really found Bigfoot skull? The amateur Bigfoot enthusiast discovered the so-called skull when out hiking in the Ogden region of Utah where many claim the ape-like creature roams. A hiker from Ogden, Utah has apparently made a shocking discovery that he claims proves the existence of the elusive Bigfoot. Todd May discovered the fossilized skull of the ape-like creature while out walking in the forests where Bigfoot has been claimed to roam. While no one has previously found any concrete evidence to prove Bigfoot exists, May believes the giant fossil could be the proof everyone has been looking for. A walking enthusiast, May has already claimed to have spotted the enigmatic giant twice on previous hikes around the forest hotspots. The first encounter caused the creature to appear suddenly and run off. Determined to see further sightings, he continued to hike more around the Ogden Canyon. It was around a year later that he had his second encounter during a night walk when his flashlight caught the red-furred, 8-10 feet tall Bigfoot from around 20 feet away and eventually it walked off. It was a couple of months later, back in 2013, that May stumbled upon what he claims is the fossilized skull and believes this is the proof that everyone is looking for. However, understandably, many say it is an elaborate hoax and May has received much criticism for both his sightings and the unique discovery. “There’s haters out there, other Bigfoot enthusiasts that don’t like that I found something first,” stated May. Geoscientist, Jess Carlucci from Midwestern State University has examined the fossil closely and concludes that it is in no way the skull of Bigfoot and is nothing more than a very large rock that has gone through a lot of weathering. Bigfoot, or Sasquatch as it’s also known, has been the subject of American folklore for many years with many claiming its existence but no real evidence has ever been presented.